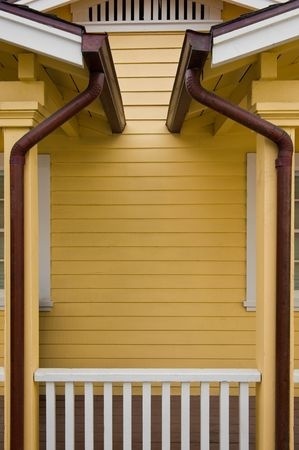 The siding you choose for your property is important. As the outer “layer” of the home, it is one of best defenses you have against the harsh weather outside. It also adds to the design and attractiveness of your exterior. Siding enhances the structures cosmetic value and can help give it that distinct look. Choosing the right siding for your unique property is essential for creating lasting appeal. There are many options when it comes to the siding you choose. Two of the most popular materials are aluminum and vinyl. Below we discuss the advantages of each. Durability – Vinyl is twice the thickness of aluminum making it a strong, durable material. It is also less prone to dents and scratches. Lasting Color – Many appreciate the lasting look of vinyl siding. Since its color is baked-in during manufacturing, it doesn’t need to be re-painted over time to maintain a rich, vibrant look. Low Maintenance – Vinyl requires little maintenance to maintain an attractive appearance. Modern Appeal – There are many modern options when it comes to your vinyl siding choices. They are available in the many colors, finishes and designs popular today. Lightweight – Aluminum is lightweight making it simple and easy to install. Paintable – Aluminum can be painted and re-painted over and over again. For homeowners that like to change the look of their exterior often, this can be a great benefit. Waterproof and Fire-resistant – Aluminum is both waterproof and fire-resistant helping to further protect the inside of the home. Rot, termites and fire are of less concern when using aluminum. Low Maintenance – Like vinyl, aluminum is also a low maintenance option for a homeowner’s siding needs. Ultimately the right siding for your home is one which meets each of your unique needs and objectives. A professional contractor such as Custom Installations can help you discover which options are best suited for your individual project. Combining the top brands in the building industry with the best construction practices, we can ensure your home receives the quality siding installation it deserves. Contact us today to learn more about our siding services.